Ready for use! Our new bathrooms got a trial run. On May 23rd, our almost-complete bathrooms were used for the first time by a crowd attending Annie Dunn-Watson and Moshe Braner’s “Honeymoon Wedding Celebration” event. Reaction was generally positive, with people impressed by the concept and the design–and the contrast with the old bathrooms! 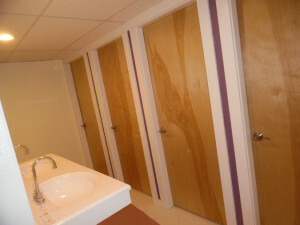 Our “multi-stall, all genders” bathroom design made sense to everyone with whom I spoke. Some were aware of the plans we’ve publicized for over a year, while others only realized what we were building when they saw the finished product. Having the ADA bathrooms upstairs and down, now, provides choices for anyone who is uncomfortable with the multi-stall plan. 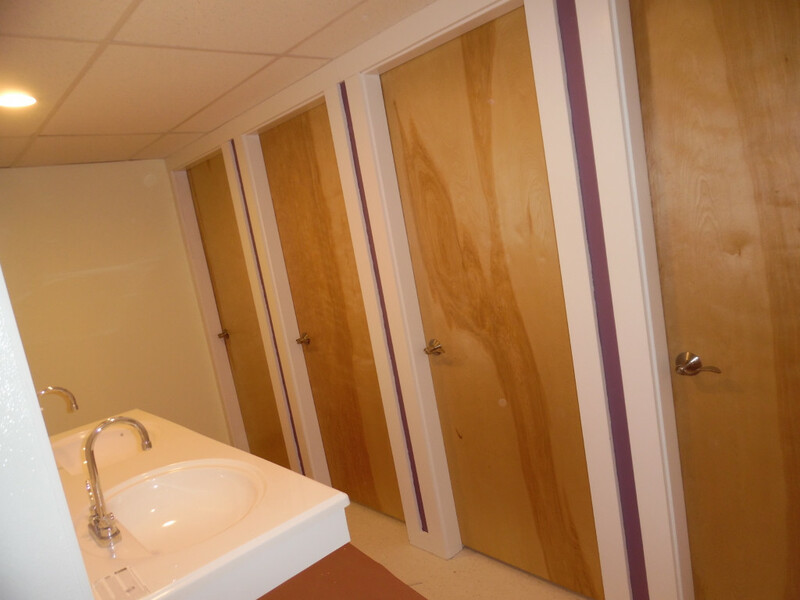 One glitch: we have found we need to modify the stall design before we declare it complete. Once the toilets were installed last week, it became clear that the in-swinging doors don’t leave enough room for easy entry. So we have come up with alternative door plans–stay tuned to see how they work out! Also, this coming week we will get the real lighting fixtures installed in the stalls, plus individual exhaust vents. 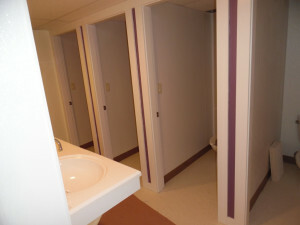 Lights for the stalls and the ADA bathroom are controlled by motion detector switches just inside the doors; the common area lights will all stay on. 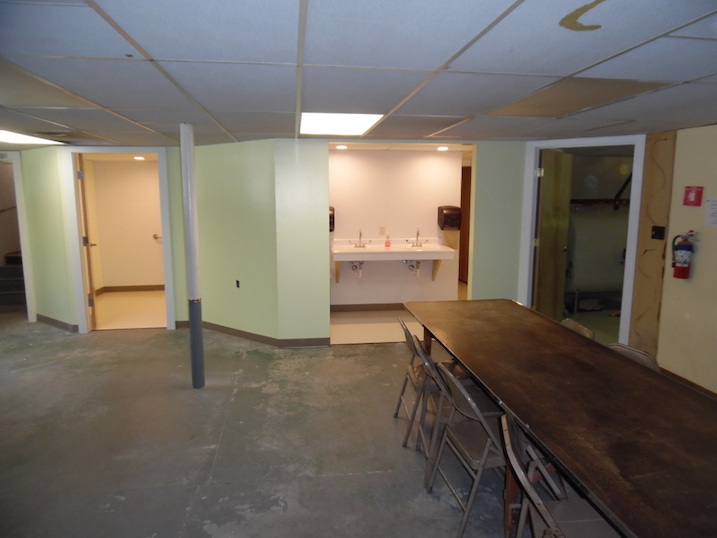 We couldn’t have gotten to this point without the help of volunteers–besides the “permanent volunteers” who keep the Grange and the Friends of the Capital City Grange Hall going, see below for the people who answered my calls for painters and cleaners! 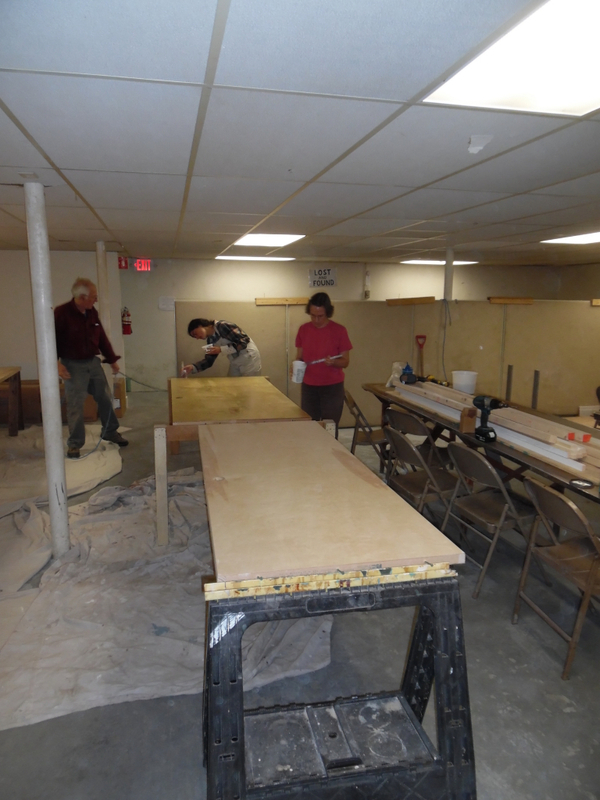 Volunteer painters get us to the finish line! Over the past couple of weeks, some dedicated folks have given up their sunny outdoor afternoons in spring to paint the bathroom walls, the trim and the doors. Pictures above show various members of the crew at work, including Dana and Marisa painting trim (first coat), Cynthia rolling paint, Marisa second-coating the trim, and John cleaning, while Marisa and Ann apply clear finish to the doors. Many thanks to all the volunteers! With construction winding down, so no more dust will be produced, we have reached the logical time to do some more cleaning, more than playing catchup with construction work. So–join us on Saturday, June 6th, from 10:00 AM to 2:00 PM to clean the dance hall, the stage, the windows (much easier than the old windows! ), the lights, and more. Bring some cleaning tools if you can: window washing squeegees, rags, buckets, rubber gloves, vacuums, window and general cleaning liquids, etc. We’ll have some supplies too. 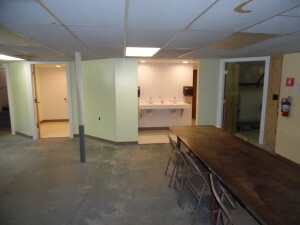 We’d love to have someone bring food for cleaners! Let me know if you can bring some snacks to keep us all going. After the clean-up, Merry and I will have shower and nap space available in our home in Northfield Falls if people want to stay in the area before the Grange meeting at 4:30. We’ll have our usual Grange business meeting starting at 4:30 PM on June 6th, following the clean-up. 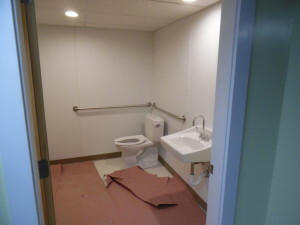 We have intriguing possibilities in developing relationships with the Town of Berlin, new liability insurance investigations, and we will celebrate the completion of the bathrooms! We’ll also have the annual Grange baking contest judging at this meeting. As usual, the recipe is the same for everyone–and the interest is in the variations that are found when different bakers work from the same starting point. This year, the recipe is for Pineapple Cookies. We ask that every entrant bring 5 cookies on a plate, with your name on a label on the bottom. You can bring more to share after the judging, of course! Sift the flour, baking soda and salt together. Beat the sugar and shortening in a mixing bowl until creamy. Add the eggs and vanilla, and beat until blended. Fold in the pineapple. Stir in the blended dry ingredients. Drop by spoonfuls, 2 inches apart on a greased cookie sheet. Bake at 400 degrees until light brown. Cool on cookie sheet for 2 minutes, and remove to a wire rack to cool completely. Yield = 3-4 dozen. And don’t forget the Grange potluck at 6:30. Bring something tasty to share–we hope to be well-supplied with cookies!